Here is something very simple and efficient to start with: Drinking. Drinking a sufficient amount of liquid – water- is an essential basic for healthy living. The intake of at least 8 glasses (or 2 liters) of clear water daily is highly recommended to keep up with the necessary dilution of toxins, hydration and bolstering of the cells. Water is the basis for the fluids of the body. Water makes up more than two-thirds of the weight of the human body. All the cells and organs need water to function. Some of the water in our body is obtained through foods we eat and some is the byproduct of metabolism. But drinking water is our main, and best, source of water. We also obtain water through liquid foods and beverages, such as soup, milk, and juices. Alcoholic beverages and beverages containing caffeine (such as coffee, tea, and colas) are not the best choices because they have a diuretic (water-excreting) effect. If adequate water is not consumed on a daily basis the body fluids will be out of balance, causing dehydration. Or, if you plan a little bit your water menu, prepare a proper herbal cold maceration. 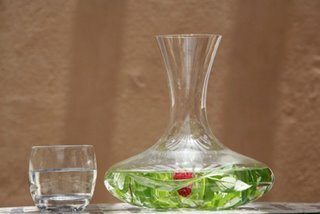 Many of you know already my Aromatic Herb Water. I remember when I made my cook off years ago here serving herb water along with my carefully selected health food….. Now we serve herb water here at Madinat Jumeirah to many occasions. The herb water has been created back home in Germany, where my mother uses to just step out into the garden and to pick the freshest herbs, flowers and aromatic leaves whatever the season has on offer and macerates them in still water for a while. The outcome is seasonal very different aromatic water, and my absolute favorite has become the scented violet water, which is only available in springtime, when these tiny flowers are growing. It is made with a handful of wild, dark blue violet blossoms. A sip of this water is pure luxury, with its almost oily, full of flowery violet flavor – simply incredible how the aroma unfolds on your tastebuds! Place all ingredients in a covered carafe and macerate in the fridge for a minimum of 12 hours. Serve chilled. I tend to use a lot of mint; and always add raspberries. It gives the herbal maceration a fresh and pleasant flavor. Mint and raspberries have also a cooling effect on the body, very much appreciated in the hot Dubai summer. I use less of the stronger tastes like rosemary or thyme. But this is a personal preference. You will see once you start playing with it. And you might come up with your very personal mix. This entry was posted in Gabi's Tips, Ingredients, Recipes and tagged food, health, Healthy, Nutrition, recipe, wellbeing by chefgabi. Bookmark the permalink. Thank you very much – I hope you enjoy also the other recipes!